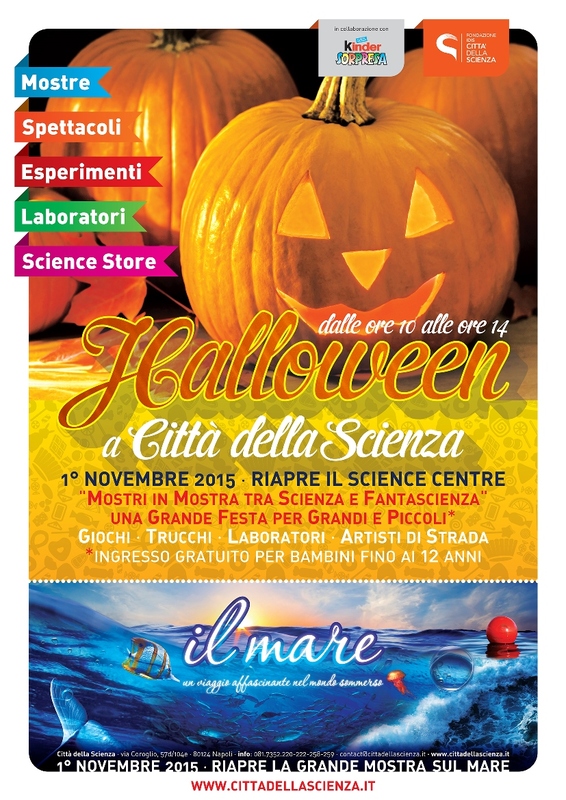 On Sunday, November 1st 2015: the Science Centre of Città della Scienza will be back with a special Halloween party, rich in scientific and creative workshops, games, tricks, street artists and science shows. In the gallery of the Congress Centre of Città della Scienza, the young visitors will be welcomed by dances, music, giant long-legged and clowns jugglers. Following there will be equipped workstations for having interesting and fun robotics laboratories, archeology and marine biology. Young artists can express their creativity in workshops inspired to the monstrous creatures of Halloween visitors can discover the origins of this celebration, before plunging into a large area dedicated exclusively to the game, with magic tricks, potions and enchanted fluids and construction bats.